You must be signed in to the ConnectWise University. After signing in, we'll redirect you back here. You must be signed in to the ConnectWise University to continue purchase. This is Available to Purchase Through ConnectWise. Contact Your Account Manager for More Details. 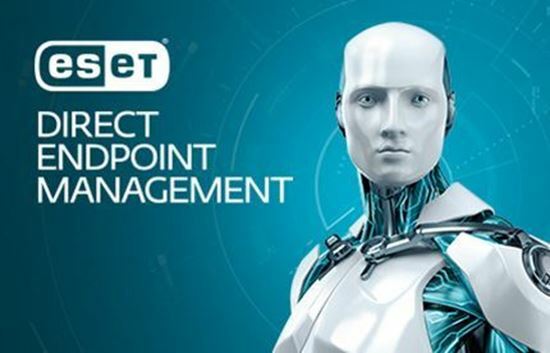 Easily deploy and manage ESET endpoints with the Direct Endpoint Management Plugin for ConnectWise Automate. Engineered for the ConnectWise Automate user, Direct Endpoint Management offers a server-free solution that connects ESET endpoints with the ConnectWise Automate Control Center. Best of all, this popular solution now includes integration for ESET Endpoint Encryption so ConnectWise MSPs can control, deploy and manage their end-user full disk data encryption straight from the ConnectWise Automate console. ConnectWise partners receive complimentary Deployment and Upgrade Service support from the pros at ESET to ensure they are set up for success! ESET Endpoint Encryption powered by DESlock is a simple-to-use data encryption solution designed for companies of all sizes to protect important data and help meet regulatory compliance standards. Support for the full disk encryption (FDE) option is built in to the powerful Direct Endpoint Management Plugin, giving users full management and deployment control straight from the ConnectWise Automate Control Center with no additional servers to set up or consoles to maintain. ESET also offers granular encryption options as stand-alone solutions (not integrated with the Direct Endpoint Management Plugin) including file/folder, email and USB encryption. For more information on those solutions, please visit https://marketplace.connectwise.com/eset-endpoint-encryption. Fully validated: ESET Endpoint Encryption is FIPS 140-2 validated with 256-bit AES encryption. Algorithms and standards: AES 256 bit, AES 128 bit, SHA 256 bit, SHA1 160 bit, RSA 1024 bit, Triple DES 112 bit, Blowfish 128 bit. Remote management: Deploy, configure, view and manage remotely via ConnectWise Automate. Remotely encrypt and decrypt, recover credentials, change username or password, and view computer status, version and license. Built for the MSP: Special maintenance mode can be enabled that allows reboot of machine without requiring login credentials. Flexible Billing: ESET Endpoint Encryption is available on a flexible monthly billing option. For more than 30 years, ESET® has been developing industry-leading IT security software and services, delivering instant, comprehensive protection against evolving cybersecurity threats for businesses and consumers worldwide. ESET’s award-winning security products are lightweight, fast and built with ConnectWise MSPs in mind. As a longtime ConnectWise Solution Partner, ESET’s integrations for ConnectWise Automate and ConnectWise Manage are built to optimize and align perfectly with the ConnectWise platform. 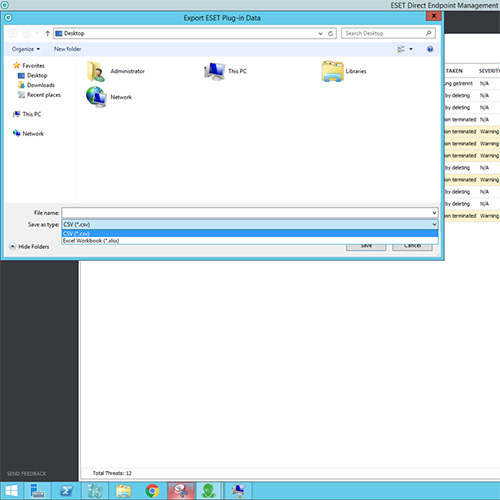 ConnectWise Automate Server 11 or later (cloud or on-premise). NOTE: The ESET Direct Endpoint Management Plugin for ConnectWise Automate is not compatible with computers managed by DESlock Enterprise Server. Manage client endpoint security: Initiate on-demand endpoint scans, module updates and ESET security product activation directly through ConnectWise Automate. Manage client configurations: Set ESET-specific configuration policies on Windows® endpoint and server clients. Create new policies or upload existing XML configurations exported from the ESET security software. Manage every available ESET configuration option including Spam, Firewall, HIPS, Device Control and Web Control modules. Full disk encryption: Deploy encryption packages to clients and activate clients’ licenses remotely. The plugin dashboard lets you filter machines based on encryption status, and other options include remote password change, as well as disabling of encryption. 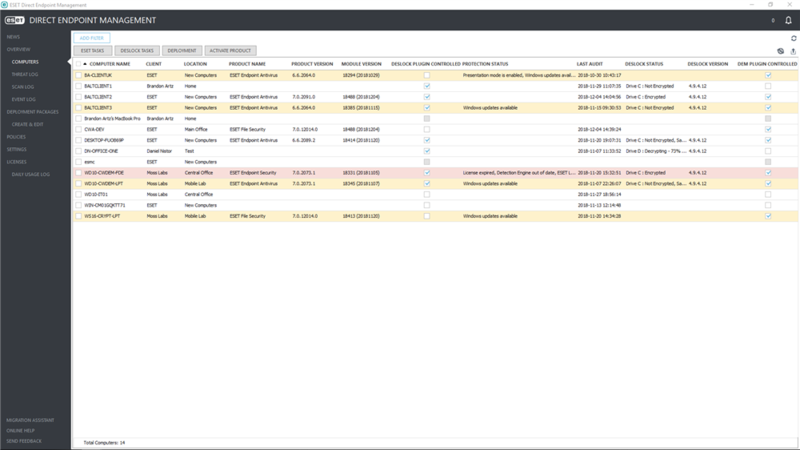 Monitor threats: View and sort threat data, and see which client workstations have detected threats, the time of detection, the name of the threat and any actions taken. Dashboards: At-a-glance views into protection status, product distribution, module update date, number of threats detected daily, deployment information and pending policy updates. Reporting Export: A report from the ESET DEM Plugin for ConnectWise Automate to view various data about client systems such as log details for scans, events, and threats, license utilization and unprotected systems. Alert management: Sample ConnectWise Automate “Internal Monitors” provided to allow for alerts on the status of your ESET environment. Only registered users can view documentation. If you have purchased licenses for this product through ConnectWise. We do provide Third Party Support assistance. If you have any application issues, please email Help@ConnectWise.com. © 2017 ConnectWise. All Rights Reserved. Terms.